Lyft has really tried to partner with Atlanta's public transportation systems to ease in the thousands of Pats and Rams fans that will joining the city this weekend. The sunny Georgian city is known for more than just the Mercedes-Benz Arena — it's home to sites like the Georgia Aquarium, Zoo Atlanta, and the Georgia Brewer's Guild where Lyft has relationships with over 40 breweries. These relationships provide specific pick-up and drop-off zones at these locations. As you may know, ridesharing services have run into the issue of safely dropping off and picking up customers... which has also raised concern (and traffic violation tickets) for rideshare drivers following the laws of the road. Having designated zones not only allows for safer pick up and drop off, but it also mitigates any traffic problems that come from illegally stopping. But that's not all — Lyft recently rolled out their very own scooters and in addition to promoting special offers and discounts with Lyft drivers, they're also giving Atlanta some special deals on scooters (which go 15 mph in the city)! With road closures already underway (and more to come), finding your way around sans car might be your best bet. But, Lyft has thought about this, too. You can score a ride from any MARTA (Metropolitan Atlanta Rapid Transit Authority) for half off during the Super Bowl weekend. Even though MARTA bus services is currently handling some Super Bowl issues, the public rail line is prepping for an extra load of riders. For those arriving to Atlanta a little early, the rail will be operating between 4 AM to 1 AM from January 29th to the 31st. During the weekend, MARTA will be there for you 24 hours a day, both bus and rail (these services will discontinue on February 5th). Fun tip: if you want to avoid the lines, then you should look into ordering a weekend pass or multi-day card in advance online. Local businesses thrive from hosting major events, but it's not just limited to restaurants and retail. Shuttle and limo services like 1st Class Transportation, Renee's Limousine, and Total Transportation start planning months in advance to set price points, driver locations, and operation logistics. Out-of-towners get to take advantage of the thousands of spectators, too. 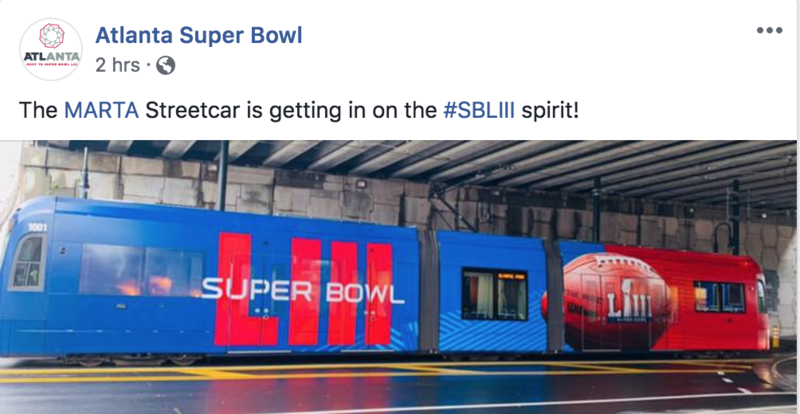 Atlanta has gotten mass ride providers from North Carolina and Iowa that seize revenue opportunities as amazing as the Super Bowl. Neighboring companies review the overall cost benefit that can come from lending a hand to the transportation overflow during a crazy weekend. You can check out providers, locations, and services here. Some cities argue the costs outweighing the benefits of hosting a major event like the Super Bowl. There's no denying that local restaurants, hotels, and retail businesses enjoy being crowded and that employees can get extra cash from working overtime and getting more tips, but those are just people that are being impacted in the foreground. Those behind the scenes are running around like crazy making sure events go off without a hitch... and when inevitable problems arise, someone's there with an immediate solution, or we could end up with another halftime blackout.